Texas Medical Supply knee walkers are a comfortable alternative to crutches. Crutches can create soreness, discomfort and fatigue. Unlike crutches, knee walkers are less stressful on the body and don't require excessive upper body support. Knee walkers properly support leg injuries as the leg rests on a secure platform. With our easy-to-use knee walkers, an individual can still be active as the leg remains in position for healing. People recovering from injuries below the knee will have fewer limitations if they use a safe knee walker. Designed for either indoor or outdoor use, knee walkers remain sturdy on uneven surfaces and provide balance. Walkers are lightweight and foldable and are easy to transport. Walkers also prevent atrophy, can increase the rate of recovery and free arms and hands. Hand and lock brakes secure knee walkers when not in motion. Our knee walkers are available to purchase or rent. We will respond to your walker requests promptly and answer any questions you may have. Our goal is to provide a transportation device for recovery with minimal restrictions. If a walker is rented for more than a year, we recommend that one of our specialists inspect your walker for safety. 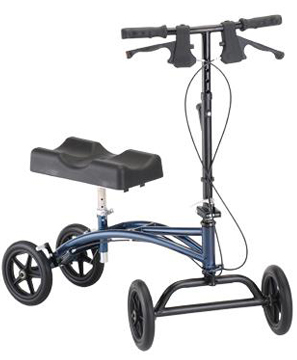 Contact Texas Medical Supply in Houston to either rent or purchase a knee walker. Our customer service team also serves the areas of Spring Valley, Sugar Land, Missouri City, Mission Bend, Katy, Spring, Pearland, Humble, Pasadena and League City.